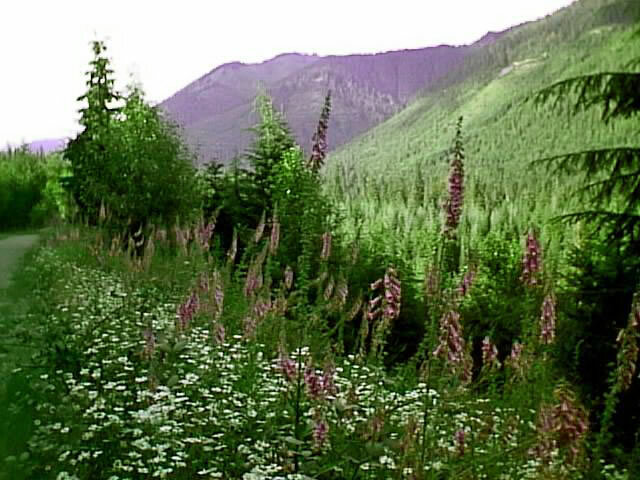 As I wander about the mountains and forests of western Washington, I often come across wildflowers and plants that I think would look great in my own home garden. I resist the urge..... and photograph them instead. and for their enjoyment by future generations. Unfortunately, many wildflowers have disappeared from the earth because of over collection by well meaning gardeners. return at an appropriate time to collect a few fresh seeds from the plant. Following a few simple guidelines will ensure that you are not responsible for the extinction of a plant. include a wide variety of plant types, including annuals and hardy perennials, vines and shrubs. Many are well suited for use in home gardens and landscapes because they are adapted to the general climate and soils of an area, however some species will not tolerate conditions normally considered ideal in a home garden. Many are actually better adapted to harsh conditions, such as hot, dry slopes or wet, boggy areas. Select wildflower types that grow naturally in conditions similar to yours, or it will be necessary to change your growing site to suit the plants. With a little planning and using Mother Nature as your model, you can easily design a beautiful Wildflower Garden on your property. Always get permission from the land owner before collecting seed. Check laws and regulations before you collect seeds from city, state or national parks. Properly identify the species. This is usually easiest to do when the plant is in bloom. Store each species separately from other seeds. Include notes on the growing conditions where you harvested the seeds. Never collect more than a very small percentage of the seed from a wildflower population. Once established, you will be able to get additional seeds from your own plants. If there are only a few plants of a particular species in an area, locate a commercial source of the desired plant. Wildflowers may be very obvious while in bloom, but often by the time the seeds are mature, the plant will seem to disappear into the landscape. Do a little advance scouting and mark the location of desirable plants, so you can find them again at seed harvesting time. Never harvest seeds until they have ripened on the plant (after seed heads begin to brown but before seeds drop out). This usually takes at least a month. Do your homework, so you will know of any special requirements for growing the particular seeds, such as chilling, light or darkness, or extended dormancy. It would be pointless and wasteful to plant seeds which were unable to grow because they required light for germination. Success with growing wildflowers depends mostly on the conditions and preparation of the site. Perennial wildflower species naturally found growing in the woods, are accustomed to rich humus soils and will benefit greatly from the same soil preparation given to your cultivated garden flowers. Fertilizers are generally not necessary for wildflower establishment. The soils for field or meadow wildflowers tend to be different from that needed for woodland wildflower gardens, in that it is generally less fertile and lower in organic matter. These plants generally are more tolerant of poor growing conditions. Many wildflower seeds require a dormant period before germination. If they are planted too soon after harvest, they may germinate early, and be unable to establish themselves before winter, and consequently die. Sow seeds of most wildflowers, especially spring and early summer bloomers, in the fall from September through November. This allows them to benefit from the fall rains and cold winter temperatures, after which they will sprout and begin growing when the spring sun warms the soil. Late winter or early spring sown wildflower seeds are susceptible to loss from heavy rains as well as from prolonged dry spells. Spring sown perennial wildflowers usually will not bloom until the following season. One of the most common mistakes when planting wildflower seeds is failing to get rid of the weed seeds that are already in the soil. Weed seeds will germinate at the same time as your wildflowers, but will quickly outgrow them, and choke the life from them. Before sowing your wildflower seeds, remove all weeds, and cultivate the soil lightly (never more than one inch deep, when growing wildflowers). Rake the soil to even it out, leaving shallow grooves. Broadcast the seeds evenly over the entire area, then, using the back of the rake, smooth the soil over the seedbed. Tamp the soil lightly to ensure that each seed is in contact with the soil. Apply a light mulch to prevent soil crusting and erosion. For more even distribution of the seeds, mix them thoroughly with four times their volume of sand or vermiculite. Some seeds have a hard covering which must break down naturally in the soil before germination. This process can be speeded along considerably by a process called scarification. This can be done by filing a small area on each seed, or cutting a nick into the seed coating with a knife. Avoid commercial wildflower seed mixes that contain too many different species of wildflowers. These are often filled with less desirable types of plants. It is better to sow single species, or create your own wildflower mix. Begin a program of careful watering as soon as your seeds sprout. Seeds should be stored in a cool, dry place away from light. Many species of seeds will last up to 10 years when sealed in glass jars or freezer bags and stored in the freezer. Never sow all of your seeds of a particular plant at the same time. Set aside some extras just in case there is crop failure due to uncontrollable conditions.